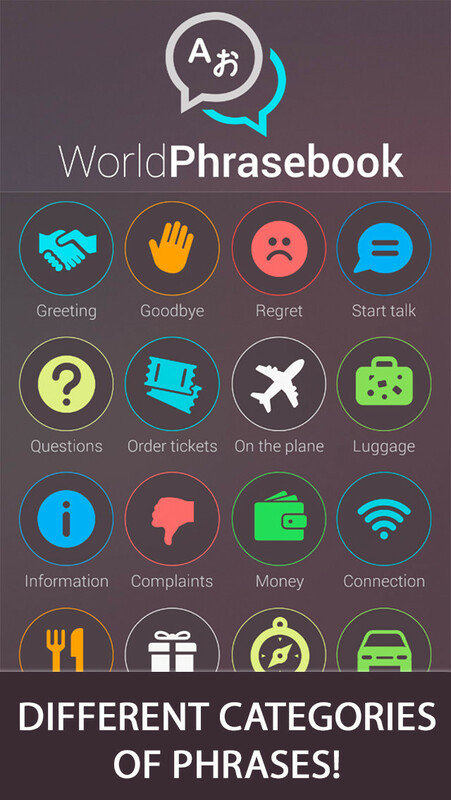 World Phrasebook FULL is a new language application for most communicative travelers! You can use it in any trip around the world! It contains lots of phrases and thematic words, divided into topics in 6 popular languages: English, French, German, Spanish, Italian and Portuguese. With World Phrasebook FULL travel abroad becomes more easy, interesting and educating, because you can learn new languages with ease through practice and communication with native speakers of this 5 languages! World Phrasebook FULL will help to remember and explore the most commonly used and necessary phrases and words. 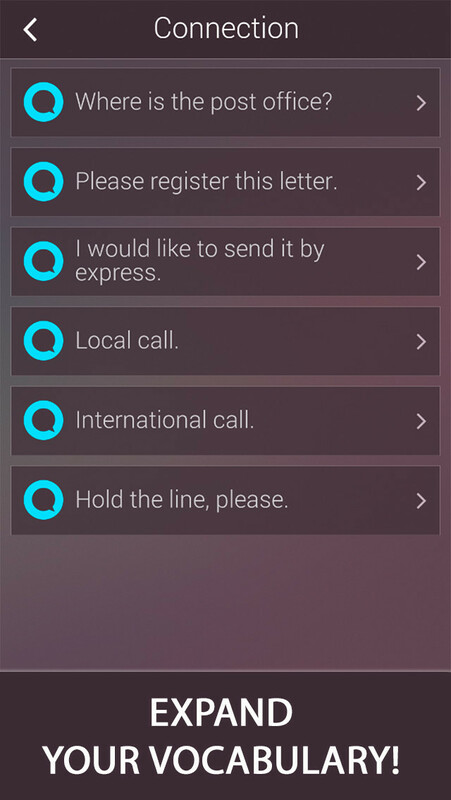 With its intuitive menu you can easily orientate in phrases and situations that you need. World Phrasebook FULL has large database and it allows you to find information quickly in any of 5 languages you want. Open the application and choose category you need. You will see the list of phrases and sentences in English. Find the phrase or sentence you need, click on it and you will see the translation into 5 languages - there are icons with flags of those languages from the left. Use the sentence you need. - Educational application - it will help you to learn other languages. Take World Phrasebook FULL to travel with you and you will have 24-hour access to the dictionary for any cases. It is time to see the world, to meet new people and have some fresh exciting experience!